Let us plan your getaway. Adults Only Boutique Hotel, just 25 min from Liberia Airport. Perched on the hillside overlooking Playas del Coco, we invite you to our exclusive, 8-room adults-only hotel to relax, unwind and allow yourself to be pampered on your special vacation. Just 25 minutes from Liberia International Airport, our location is ideal for a quick Costa Rican getaway or an extended stay. At our luxury boutique hotel, all guests receive our meal-inclusive plan, which includes three exceptional a la carte meals each day. Our menu is designed to offer you fresh, locally grown ingredients which highlight the unique flavors of Costa Rica and International cuisine. Our guests also have the option to change their meal-plan to include alcoholic and non-alcoholic drinks every day. See our All-Inclusive option below! 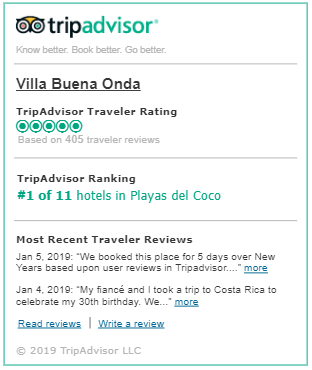 Why Stay at Villa Buena Onda Boutique Hotel? Let our service-oriented staff show you some authentic Costa Rican hospitality. At our diminutive hotel size, we are proud to have more staff than guest rooms. By the end of your stay, you will feel part of the Villa Buena Onda family. We pride ourselves in delivering exceptional service. The boutique, intimate and secluded atmosphere makes our property an ideal Costa Rica wedding venue. If you want to visit other destinations in Costa Rica, after the wedding, like Arenal Volcano, Monteverde or Manuel Antonio, to name a few, we recommend a local travel agency, Costa Rican Vacations, to help design your custom package! Get ready to be treated like a royalty! When it comes to great comfort and luxury in an adult-only setting, Villa Buena Onda is perfect for you. Stay for a couple of days or on an extended vacation; regardless of your choice, our Villa will be excellent for you to relax and recharge energy. This exclusive boutique hotel celebrates both local culture and nature, providing an insider’s perspective into the Guanacaste area, and allowing you to experience the best of Costa Rica. Villa Buena Onda is the only meal-inclusive adults-only boutique hotel in Costa Rica. For us, luxury is best experienced without big crowds or constant bills, thus providing a less worried, more intimate connection with the area. One of Villa Buena Onda’s greatest attractions is its closeness with nature while still offering all the comforts of modernity. Sit back and relax at the pool, where you can savor a cocktail or two and listen to the chirps of the birds from the surrounding tropical forest. Marvel at the beach views from terraces and rooms, protected from the rest of the world in luxury. The hotel itself offers great privacy, constructed away from the prying eyes of neighbours. Since it has only 8 guest rooms, our staff can offer a more personalized experience to each of our guests, which we design for comfort, intimacy, and relaxation. If you want to explore the beach by yourself, take one of the hotel’s shuttles to the nearby Coco beach, where white sand and palm trees help you unwind in peace. Watch the sunset after a day of bathing and disconnecting from the world, in a romantic setting away from the fuss of the world. This whole experience is topped by the fact that your stay is meal-inclusive. Enjoy your choice of gourmet meals at the excellent on-site Nya Restaurant without having to reach for your wallet constantly. All-inclusive stays are also available as a special offer. Exclusive access to the Beach Club is also granted to those guests staying with us. Here you can enjoy tennis courts, more pools, and delight your palate with Greek dining options at an extra cost. Take full advantage of this opportunity to live at your heart’s content at our exclusive Costa Rican adults-only all-inclusive resort. To celebrate the perfect wedding, you need the perfect venue. Let Villa Buena Onda’s experts help you organize an event surrounded of modern luxury and natural wonders. We offer not only our facilities, which include the gourmet Nya Restaurant and an infinity pool, but also wedding planning services, should you need them. Our goal is to create a stress-free environment, so you can concentrate on the life you’re starting with that special person. The tropical vegetation and beach become the perfect backdrop for all your photos and moments, coupled with a relaxing stay and the chance for gorgeous sunsets. On this special occasion, enjoy a carefully personalized day dedicated to you both, where we make sure everything ranging from flowers to music is spot on. Simply contact us and let us know what you have in mind, and we can start working together towards the wedding of your dreams. For your unique honeymoon getaway with that special someone, Villa Buena Onda is here to make it a beautiful memory, preserved in time. It is time to escape to Costa Rica and experience luxury, privacy & intimacy! Celebrate the start of your life together in the luxury, adult-only environment of Villa Buena Onda. The Villa offers intimacy, pampering spa sessions, and the opportunity to explore this lush tropical country. Choose whether you want to sit back and relax or pump it up with adventure, and we will gladly arrange a vacation full of massages and tours. Tell us more about what will make this celebration special/unique so we can help you make it unforgettable. Our dedicated, stress-free outlook will definitely help you appreciate each day of your stay in one of the leading luxury all-inclusive hotels in Costa Rica. Villa Buena Onda can also be a good option for your group of friends or extended family. Both the surrounding area and facilities offer opportunities for fun and exploration, as well as relaxation. If you seek adventure, let us know immediately. We can book and provide tour recommendations in the area for thrill and nature lovers, such as white-water rafting, scuba diving, hiking on a volcano, or wildlife spotting. If you are looking for something extra special, our signature Private Hidden Beaches Tour is a must! In addition, if you want to plan an event for a large group, it is possible to rent all the hotel and its facilities. The Villa can also double as a rental so you can have plenty of space and the staff all to yourself. It is important to note that if you choose this option, children are also welcome in, so long as they’re accompanied by a responsible adult. When used as a rental, the Villa will also have meals included. Also, whether you want to travel solo, with your significant other, or with a group of special people, Villa Buena Onda is the perfect place for your next vacation. Feel free to inquire for any details you may need. We are happy to welcome you to Costa Rica.